This homemade costume for families entered our 2016 Halloween Costume Contest, and won 3rd place in the Best Family Costume nomination! We put a homemade spin the popular Pokemon Go game. The kids all chose their favorite Pokemon characters which included a Charizard, Blastoise and Pikachu! Our Poke hunter, Ash, carried a retractable pokeball to capture the pokemon. We even had a human pokestop! 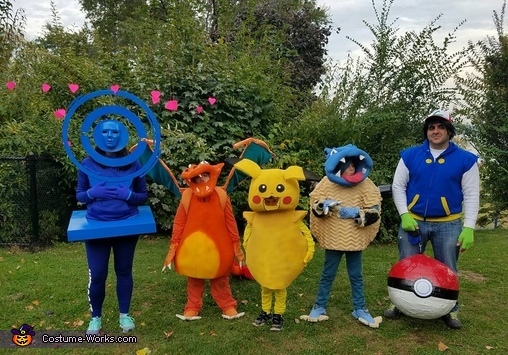 The three Pokemon costumes were made from foam and spray paint.